In the eyes of your average American citizen, there's very little to distinguish a gamer from a foreigner. Foreigners, more often than not, are regarded as strange and inscrutable people with cryptic languages and disconcerting customs, and gamers can also be described as such. It's easy to pigeonhole both foreigners and gamers into narrow stereotypes and close off the possibility of a real connection. After all, massively multiplayer online games wouldn't be quite as massive if there weren't players from all over the world playing them simultaneously. They're the perfect melting pot for two players from across the globe to find one another, which is exactly what happened to me. I've always had fun in tabletop gaming environments, and I've been behind the joystick of plenty of arcade games and home consoles. So when a friend and coworker told me about a game called EverQuest, I was immediately interested. We might have been the only two people in that little American town who had an interest in portraying fantastical heroes or villains, slaying eldritch creatures and earning the respect and rewards that come from such conquests. But thanks to EverQuest, we were united with people from all over the world in our common interest. My ex-wife was less enthusiastic, claiming that interacting with a bunch of pixels is a poor substitute for real human contact. I spent a lot of time on EverQuest, and to this day, my ex-wife holds the game partially to blame for the dissolution of our marriage. After a nervous breakdown and several months of attempted recovery, I moved in with my parents and struggled to regain the confidence and forward momentum I'd lost. I didn't just find teammates in EverQuest, though. Thanks in part to these truly international communities, I found a community and an identity that liberated me from the shackles of self-discouragement. 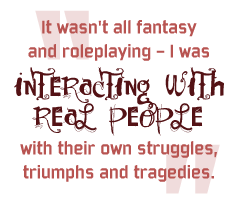 It wasn't all fantasy and roleplaying - I was interacting with real people with their own struggles, triumphs and tragedies. And when I met someone from another country in an unexpected turn of events, it was clear that she would change my life for the better. For the sake of anonymity, we'll call her "Ama." I met Ama when I changed servers in World of Warcraft. I was looking for a fresh start, a place where I could build a new character from the ground up in terms of both story and gameplay. It wasn't long before I joined a roleplaying guild, and it was there that I first encountered Ama.